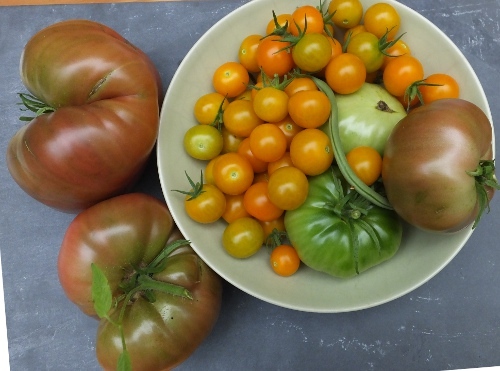 Ironic, that I didn’t intend to grow tomatoes – getting plenty of them from a local farmstand and from our CSA box – but that I put in just a few seedlings that a friend gave me, and some seedlings I grew to give away but never got to, and that now tomatoes are my most successful crop! That big one weighs a pound and a half! All three ripe ones are Paul Robesons, officially the only big tomato I’ve ever been able to grow to maturity. A day or two on the counter will bring out their blush. They’re divine raw, sliced, with salt and pepper, or mixed into a cucumber salad. I keep finding lots of green tomatoes on the ground. They don’t go to waste: I fry them up. There is also always a ripe or near-ripe one that is half eaten. Those go to the chickens, who love them.